Woowww its been so long since I’ve posted anything….This past month has be crazy crazy crazy. I’ve been trying to wrap up the school year, while working, and while still trying to maintain accountability with friends. It’s been quite the struggle. I’ve been learning and am still learning how to balance it all without going insane, and at the current moment, I’m quite okay. The long awaited spring break has finally come, and I am trying to make the most of it. Every time I come home, I go to the Farmers Market every Saturday morning to pick out fresh fruit, veggies, and juice for me to snack on instead of chips and other stuff. My usual haul always contains of a quart of fresh pressed apple cider made from whole apples, small cucumbers which I always pickle, a “teaser” size of fresh kettle popcorn, fresh strawberries, and a giant 10 pound bag of oranges for me to squeeze into fresh orange juice. At the farmers market, there is always this one stand from a bakery. I always go and buy three cheese breads. SO GOOD. Its this thin bread kind of thing that has been twisted in parmesan cheese and baked. Best when fresh. Anyways, along with their cheese bread, they also sold a variety of baked goods which included cupcakes, pavlovas, and fruit tarts. The fruit tarts caught my eye and they were so beautiful, I’ve been thinking about them ever since. 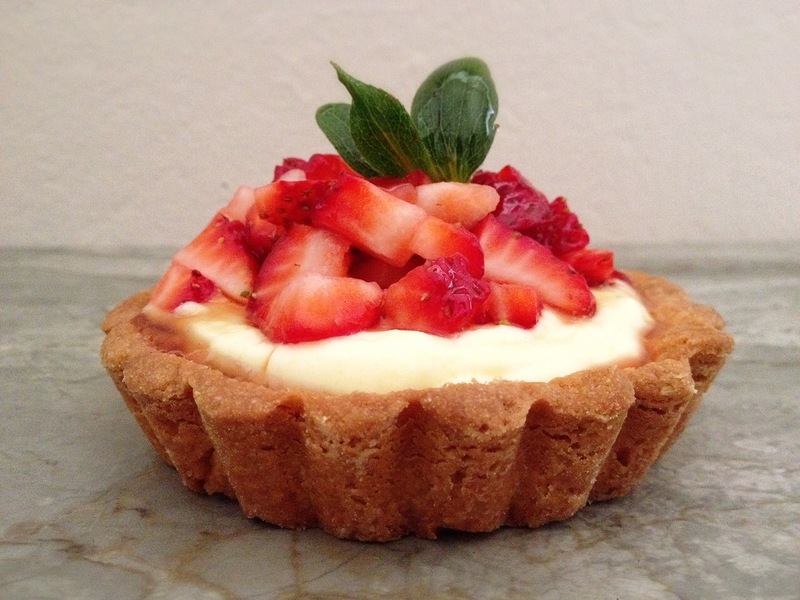 I had the strawberries that I bought from the Farmers market and just decided to make strawberry fruit tart. I went to Sur La Table to get the tartlet dishes. Oh my I could spend hours in that shop if I had the time. But I didn’t so I just bought four 4inch pans and headed out. 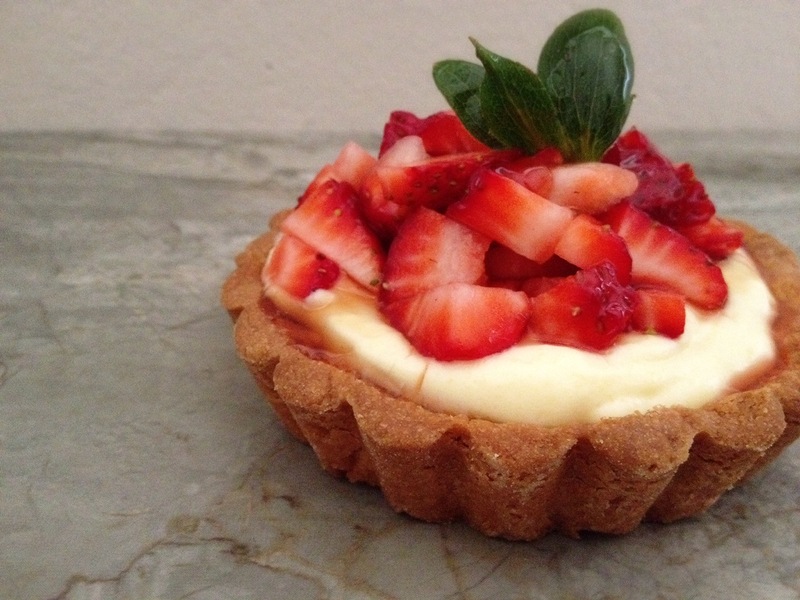 A general fruit tart consists of three components. The pate sucree (also known as the sweet shortbread crust) as the base, the pastry cream filling in the middle, and the fresh fruit on top; I am using strawberry. I’ll be honest, I was a little intimidated by the crust, just cause pie crusts have always been a challenge even though this isn’t exactly a pie crust. I found the recipe base that I wanted to use, and then modified it to how I wanted it to be. While the measurements are the same, I modified the directions based on what I read from other recipe and really like how it came out to be! I completely let the crust cool before adding on the pastry cream, which I lightened the consistency by adding some fresh whipping cream. Learned this from my previous job at Beard Papa’s…we always lightened up the vanilla custard with whipping cream and sugar! I went to my fridge to take out the strawberries and yikes! I forgot how huge my strawberries were…I ended up having to dice them up to fit on the tart, but that just means less chewing! Everything came out really well together, we’ve got the crunchiness of the crust mixed with the smoothness of the pastry cream and the sweetness from the strawberries. A whole lot easier to make than I thought it would be, definitely will be making more soon! Blend all the ingredients in a food processor until it begins to clump together. Pour out onto floured surface and clump all together so it forms a smooth ball. Cover in plastic wrap and refrigerate for 10 minutes. Butter and flour four 4inch tartlet pans. 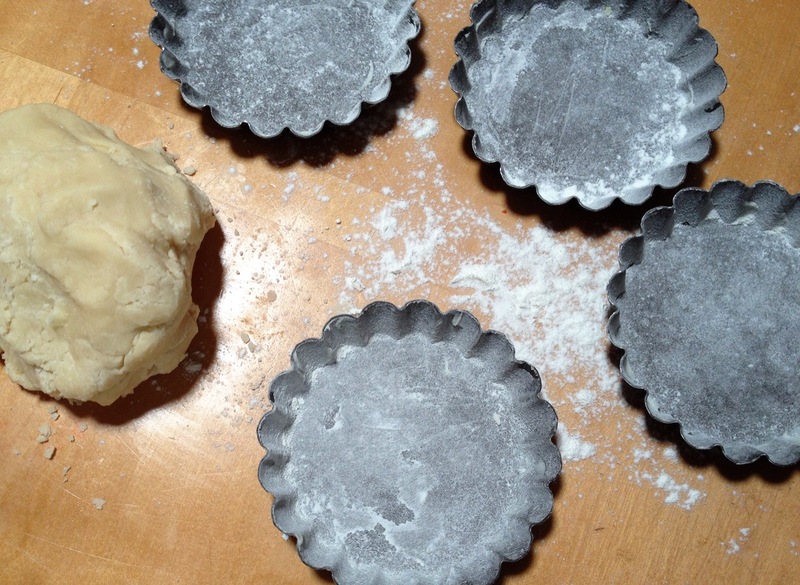 Divide the dough into 4 even portions and press into the tartlet pans so it is evenly distributed and smoothed out. Once you have finished all four, cover with plastic wrap and refrigerate for 10 more minutes. Preheat oven to 425 degrees. Take the tart crusts out of the fridge and using a fork, poke small holes into the bottom of the crust. 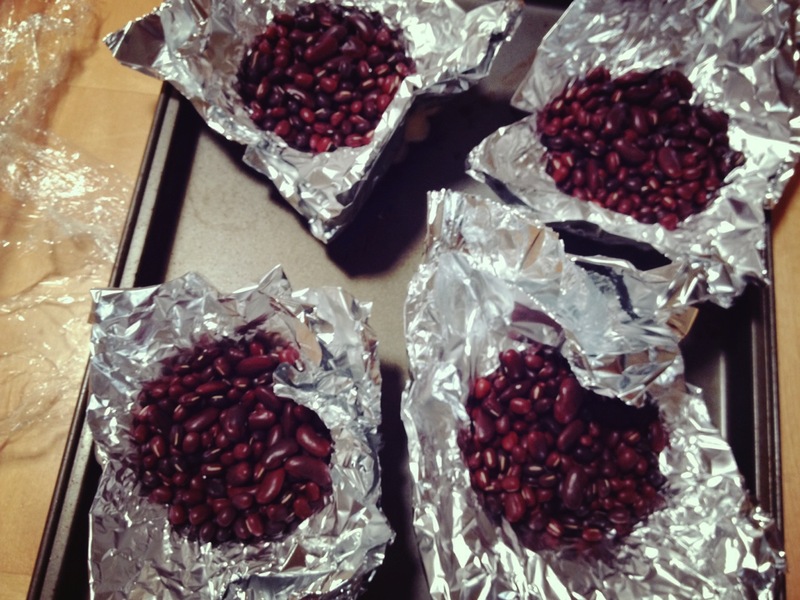 Use aluminum foil and cover the top of the crusts, and pour in dried beans to use as a weight. This keeps the crust from poofing up while baking. Put into the oven for 15-20 minutes, until the edges are golden brown. Take out of the oven and remove the beans and aluminum. Bake for 5 more minutes until the crust is completely golden. Let it cool completely before gently removing from the pans. Set it on a cooling rack to cool even further. In a medium sauce pan on medium high heat, bring the milk and the vanilla to a boil. In a separate bowl, whisk the egg yolks, sugar, flour, and cornstarch. As soon as the milk boils, lower the heat to medium and add 1/4 of the heated milk mixture into the egg yolk mixture. Whisk fast, being careful not to cook the egg yolks and make scrambled eggs. Once it has been fully mixed through, pour the egg yolk mixture back into the sauce pan, continuing to whisk to mix through. Keep stirring until the mixture thickens. Strain the mixture into a clean bowl, cover with plastic wrap touching the cream, and let it cool to room temperature. Once completely cooled, whisk the heavy whipping cream on high until it holds a peak, and then fold into the custard. Take the pastry cream and spoon two spoonfuls into the cooled crusts and smooth it out. Dice up the strawberries and pile onto the pastry cream. Drizzle on the strawberry glaze and enjoy!